When listening to Witchrider, you can not help but be drawn in by their magnetism. They have a haunting beauty that proves to engulf and ignite. As frontman Daniel Dorninger says, "the thing about making music is, there are no boundaries. It''s like a spirit of emotions that eventually passes through your body...you never know what you''re gonna'' end up with". The band formed in 2012 in a town called Graz, Austria, Yes the same place as Arnold Schwarzenegger is from. Now it is time for Graz to be known for something way cooler than this. 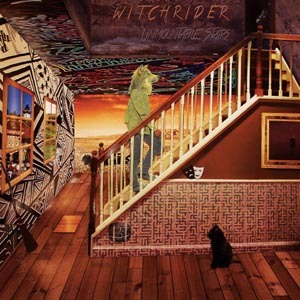 Witchrider sport a mutual love for the quirky riffage of heavyweights QOTSA and Eagles Of Death Metal, as well as an affection for the dark elements of Soundgarden. Siphoning fuel from these powerhouses, Witchrider offer a genuinely refreshing take on their own brand of stripped down, fuzzed up alternative rock. Living and breathing their music is crucial to the four-piece, and as such, they are constantly writing and honing their craft. "Being able to work on music all the time is essential for all of us. That''s why we record most of our stuff at home if we can. There''s even a freakin'' drum kit next to my bed! ", states drummer Michael Hirschmugl. Although the songs work with each other as a collective piece of work, Witchrider''s music is diverse and has an array of influences. "I always found musical style not really that important. What counts the most is whether you can identify yourself with the music or not. I know I can and I am happy about every person who can as well. I think that''s what makes music cool''", says Hans-Peter. As well as basking in the writing process, the band are supremely dedicated to playing live and fans will have ample opportunity to see the quintet as they hit the road this autumn supporting label mates Truckfighters''. TRACKLISTING: 01. OCD 02. 1 FOR 5 03. BLACK 04. I''M OUTTA BREATH 05. FAR FROM YOU 06. SP 07. THE CABIN 08. THE FOG 09. UNMOUNTABLE STAIRS 10. WITCH-HUNT 11. STYX.